These fair-trade pillow shams are made from 100% all-natural linen. 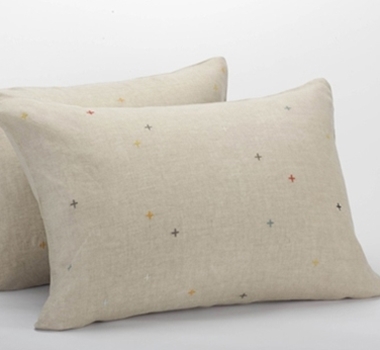 A constellation of satin-stitched crosshatches dots the front of this natural-linen sham. The washed fabric has a relaxed feel and graceful drape that recalls vintage linen, and the varied colors pair with many items in our bedding collection. The shams are finished with a knife edge and coconut shell buttons. Slight variations in the embroidery make each of these hand-crafted pieces unique. These shams are machine washable. We recommend using warm water, non-phosphate soap in the washing cycle, and a cool, no/low-heat tumble or line dry. The best way to dry, in our opinion, is to hang dry your Coyuchi products on a clothesline outside, capturing and bringing the magic of the outside back in. Wash with like items, wash whites and colors separately. For white fabrics, we suggest using non-chlorine bleach. Tumble dry low heat or line dry. Whiteners, such bleaching agents are not recommended and may diminish the brilliance and depth of the colors; when needed, use only non-chlorine bleach. Please refer to the product tag for more specific instructions.